Phil Dawson never really dreamed of this moment. The Cardinals kicker is on the threshold of a major milestone, but it's not what he envisioned when he was playing linebacker in high school in Texas. "I never really wanted to be a kicker, so I didn’t look up to kickers, and probably still don’t," Dawson said. "I wanted to be a player." Dawson laughs as he jokes that kickers aren't players, but after 20 seasons, he's reached a serious point in his career. Colts kicker Adam Vinatieri is the only active player who has tallied more games than Dawson. Dawson could move to seventh-most games on the all-time list by the end of the season, passing Jerry Rice, Brett Favre, and kickers John Carney and John Kasay. "I don’t know that I ever could have imagined playing this long, but to reach 300 games is a testament to a lot of people who have supported me over the years and a lot of coaches that have poured into me, and a lot of hard work, so that’ll mean a great deal to me," Dawson said Wednesday. But Dawson coupled each answer with a caveat. "Obviously, coming off a game like last week, super downer, so you’re going to have ups and downs, and to be able to survive them and accomplish something like this means a great deal," he said. With a dry sense of humor, Dawson is still reckoning with a three-point loss to Seattle in which he missed two field goals: one from 45 yards and one from 50. "You know, I went around today, and I was like, ‘You want to be encouraged?’ And everyone was like, ‘Yeah!’ And I was like, ‘You could be me this week.’ And that put a smile on everybody’s face," Dawson said. "So I’m trying to deal with it with some humor, and obviously I’m suffering each and every moment – just want to get back out on the field, and try to get going." His next chance to set things right comes Sunday against San Francisco, where he played four of his 20 seasons. After going undrafted, Dawson won the starting job in Cleveland in 1999. He played 14 seasons there before heading to San Francisco and eventually to Arizona in 2017. 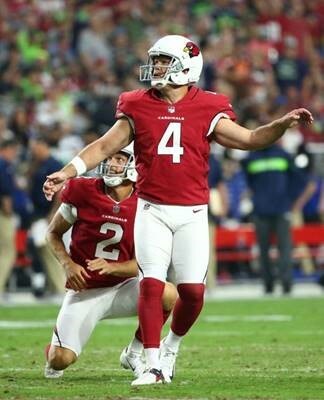 He's made 33 kicks in his time as with the Cardinals, including three game-winners. But even a few days after the loss to Seattle, his most recent performance was all he would allow himself to think about. "It lingers," Dawson said. "I can remember misses from 18 years ago. It’s unrealistic to think that I’ll just all of the sudden forget about it. But I’ll use it for good, and no one will work harder to be prepared next time than I will." But when the kick is good? "You know, I wish I could remember those as much," Dawson said. "The high moments in this league are great, but they’re not as intense and they don’t linger as long as the bad ones." Even if he doesn't remember the makes as well, they've certainly happened. He's made 437 over the course of his career, in 521 attempts, good for 83.9 percent. His latest field goal, a 23-yarder in that loss to Seattle, moved him to eighth most all-time. "I think it's huge, just from the mere fact of him being in the league this long, with being as accurate," coach Steve Wilks said. "I know that comes with the understatement of what happened last week, but pretty impressive over his career. So I think that says volumes about him." Wilks said he talked to Dawson about the misses on Monday. He finds in-game corrections on kickers can sometimes do more harm than good, so instead, the coach called Dawson up the next day. "I’ve been living on egg shells for 21 years, so yeah, anytime you get summoned to the head coach’s office, that makes you think twice, especially coming off a game like I had," Dawson said. "But we had a nice conversation, we’re on the same page, and obviously looking for improvement this week." Dawson didn't just hear from Wilks. He also heard from the youngest player in the Cardinals' locker room: rookie quarterback Josh Rosen. Immediately after the game, Rosen championed Dawson to the media. "Phil’s one of the greatest kickers in the history of football, and it happens," Rosen said after his first start. He also reached out to Dawson. Dawson is 22 years and 18 days older than Rosen. That age gap is longer than Rosen's been alive, but Dawson liked the message from the precocious quarterback. "I think that speaks a lot about his leadership," Dawson said. "Here’s a rookie making his first start, and he comes up to the second-oldest guy in the league and has some words of encouragement. So I was impressed by that, and I think this whole locker room can benefit from leadership like that." While Dawson speaks highly of Rosen's leadership, the kicker has been able to influence his teammates, as well. "I've gotten a lot of great advice from him," punter Andy Lee said. "Football-wise, life-wise, money-wise, just advice on certain things. ... I would say just all around, he's just a great guy that you can bounce things off of, and you know you're going to get something truthful and honest and very useful." When Lee heard about the milestone, he started calculating how much longer he would have to play. He said Dawson reaching 300 games is "inspiring," and that was even before he found out how small the company was. "I didn't even realize it was that low of a number," Lee said. "But to do something only 11 guys have done is pretty impressive." Dawson says he hasn't talked to the other 10 – "they’re really old" – but that one day, his place in NFL history will sink in. "That will be something, when it’s all said and done, I think I will take a lot of pride in," Dawson said. "But like I said, I have a job to do this week, and I just don’t have the luxury to reminisce at this point."